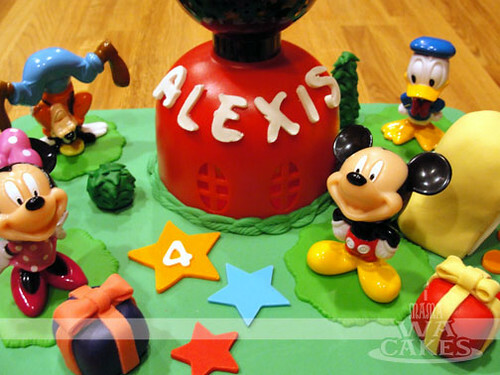 Mickey Mouse Club House Birthday Cake For Alexis! As a child, I have always loved my trips to Disney. What kid doesn't like Mickey and his friends? Personally, I was always a fan of Pluto's. Fast forward about 20 and some odd years, and it's been a while since I've seen any of the new Mickey Mouse Club shows. I realized that I had a lot of catching up to do when an old friend approached me for a cake. 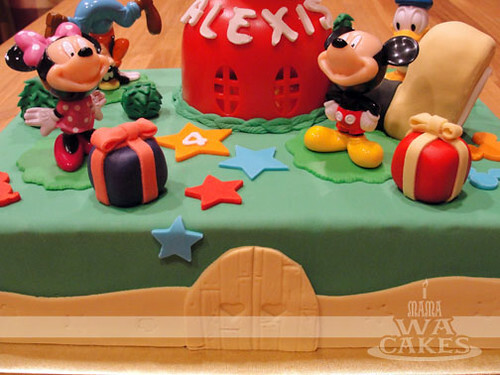 This cake was for her daughter's, Alexis, 4th birthday...and she was a huge fan of the Mickey Mouse Club House. I have never seen a single episode, and I had to find out all I could fast... starting with the Club House itself. I spent a bit of time online (bless the world wide web!) and pulled up images of the Club House from different angles, scratching my head about how I could make it out of cake. I thought about baking a half sphere for the base, and run a dowel through it with Mickey's head made out of styrofoam covered in black fondant. 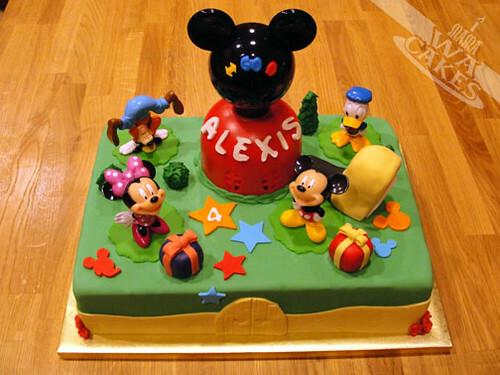 But, just as I was planning out my attack, I came to find out that she would like toys on her cake for Alexis to keep. That changes everything! I was able to find a cute game that was perfect as toppers for the cake, and also took care of the Club House. I made sure to clean all the pieces and prepped them for the cake. 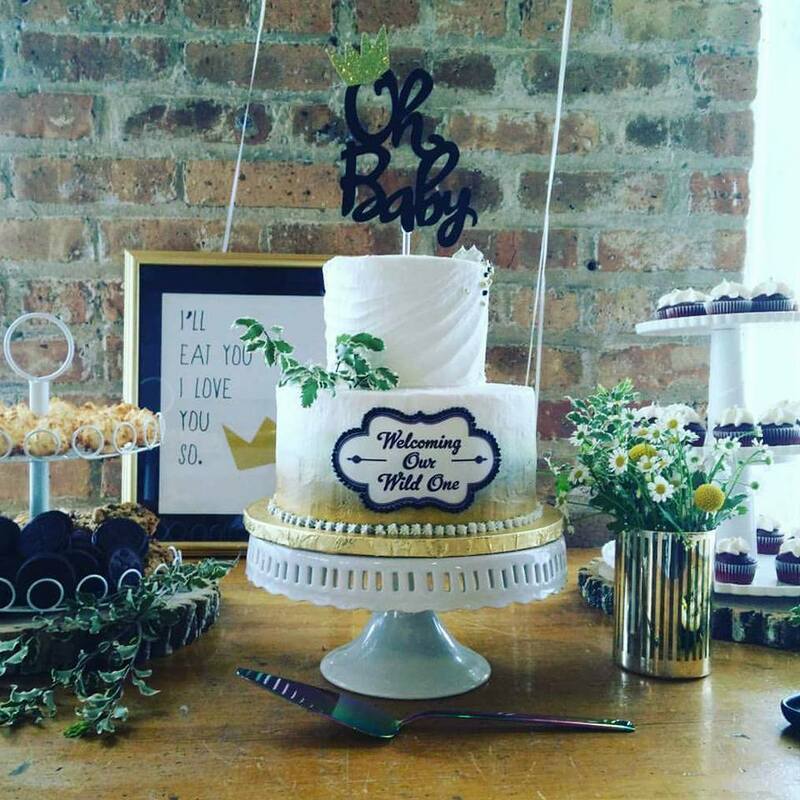 With a quarter sheet cake covered in green fondant, I rolled out a wide strip of yellow fondant and cut it to create the wavy fence that wrapped around the base. I then created the gate using an impression mat to create the look of wooden panels, and stamped in the hearts. For the Club House, I cut out a cake board circle that would fit perfectly underneath to support the weight. I measured 4 wooden dowels and cut them to length and inserted them into the cake where the Club House would sit. For a personal touch, I cut out Alexis' name out of white fondant in the same Disney font style and attached it to the Base of the House. 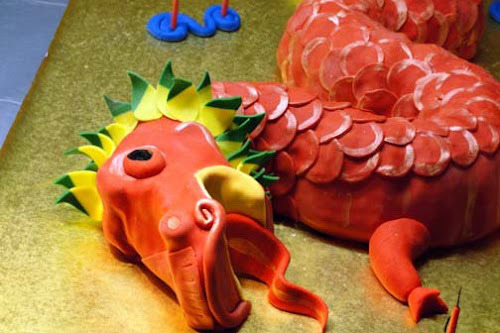 The characters were then arranged on the cake and attached with just a dab of piping gel, and the bases of the characters can easily be cleaned. With the Club House and characters on the cake, I stepped back and noticed that it was looking a bit sparse. The Club House was definitely missing it's signature entry that is shaped like Mickey's shoe. I shaped some cereal treat into the shape of the shoe and leg and covered it with fondant. I then added a door, complete with a window and golden dragee door knob. Several signature Mickey silhouettes and trees completed the unforgettable Club ground from the show. And no birthday would be complete without the gifts!